This recipe was the delicious result of finding ways to use up two (very) abundant ingredients from my garden: zucchini and raspberries. And who knew they would go so well together? This is a match made in heaven (although the chocolate doesn’t hurt any). Seriously, I convinced myself that I surely needed to test this recipe a few more times to make sure it was perfect before sharing it here. It’s a tough job I tell ‘ya. The base for this recipe came from a healthified version of my favorite childhood zucchini bread. It’s sort of a misnomer to call it a “bread” when it’s really just a cake with vegetables in it—not unlike carrot cake, which at least has the guts to call itself what it is. You’ll find that traditional zucchini bread calls for a whole lot white flour, white sugar and vegetable oil. All of which have been banished from my kitchen. Instead I’ve used freshly ground buckwheat and brown rice, coconut sugar, applesauce and coconut oil. 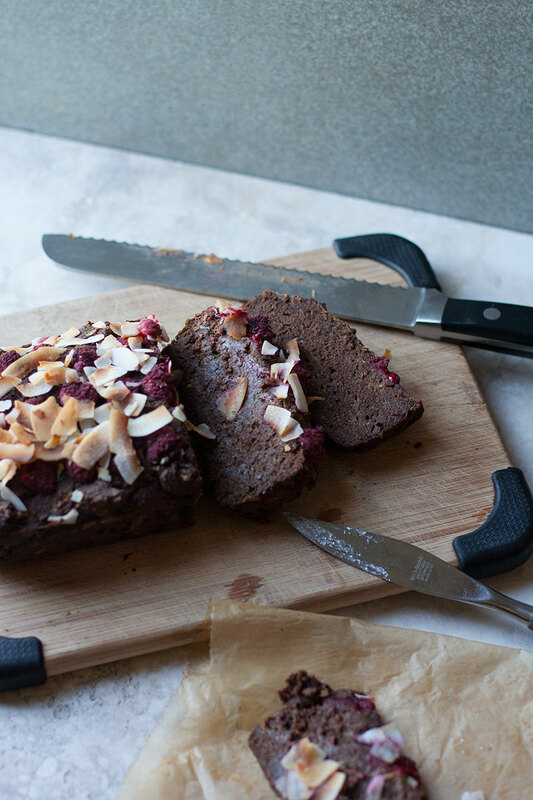 And let’s not forget the chocolate, right at home with the raspberry and coconut topping. Speaking of coconut, if you haven’t noticed, it’s all the rage right now and for good reason. Coconut is chock full of healthy (yup) medium chain saturated fatty acids. It is anti-microbial, anti-fungal and gentle on the digestive system. Coconut oil can be used for cooking, skin care, oral health and countless other uses. If you’re still on the low-fat wagon it’s time to get off that crazy train. You need fat. In fact, your brain is mostly fat, your cell membranes are made of fat, you need fat to absorb—you guessed it—fat soluble vitamins A, D, E and K. Including fat with every meal or snack will keep your blood sugar stable and your tummy satisfied. It is essential. I should also mention that polyunsaturated fats, like the ones found in vegetable oil (which is usually a rancid mix of genetically modified corn and soy—yum!) are highly volatile and prone to rancidity when exposed to heat, light or oxygen. They can cause free radical damage to your precious cells. These oils have no place in high heat cooking—or your body for that matter—which is why they have been replaced with coconut oil and apple sauce in this recipe. That’s not to say that cold pressed, organic, polyunsaturated oils such as flax, chia, hemp or walnut don’t have a place in a healthy diet—they do. But they need to be really fresh and stored in a dark glass container in the fridge. Use them for dressings or drizzling, not for cooking. Saturated fats, like the fat found in coconut oil, are more stable when heated, making them perfect for baking, frying and sautéing. Coconut oil and pastured ghee (which is butter with the milk solids removed) are my go-to cooking oils, followed by olive oil (which is mostly monounsaturated) for low heat cooking. All being said, this is a bread that eats like a cake. 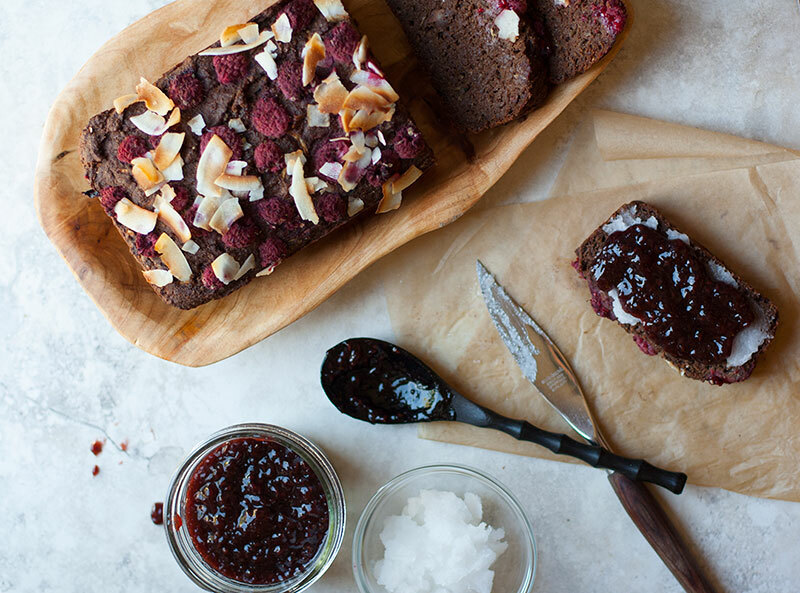 Enjoy as a rich snack or a satisfying dessert, topped with a little coconut oil or ghee (and even a little raspberry jam if you wanna get fancy). 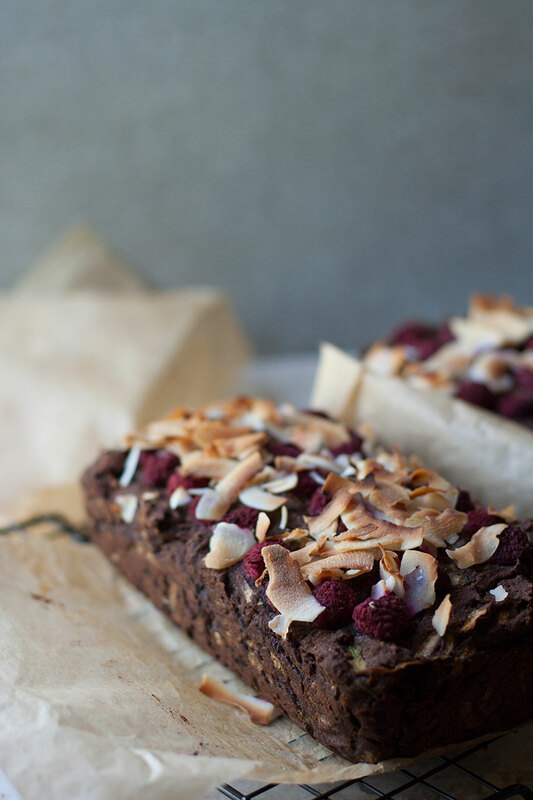 Either way, I hope you enjoy the bounty of summer in a slice of this wholesome chocolate cake! The hardest part? Waiting long enough for it to cool before slicing. Preheat the oven to 350°F. Grease a loaf pan with coconut oil and line with a strip of parchment paper so that it covers the bottom and long edges. Make the strip wide enough so that you have some overhang. Mix the dry ingredients in a large bowl. 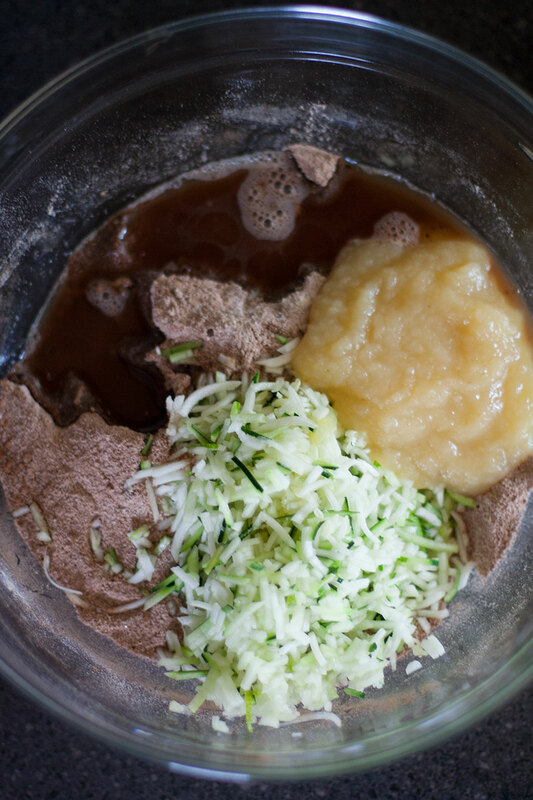 Add the melted coconut oil, applesauce, zucchini and water. Stir until just combined. Stir in the cacao nibs, if using. Transfer the batter to the prepared pan and smooth out the top. Sprinkle the berries and coconut flakes on top and gently press into the batter. Bake for 65min until no longer wet in the center. Let cool for a couple of minutes. Loosed the short edges by running a knife down the sides, then lift the loaf out of the pan, using the parchment flaps as handles. Transfer to a cooling rack and let completely cool before slicing. 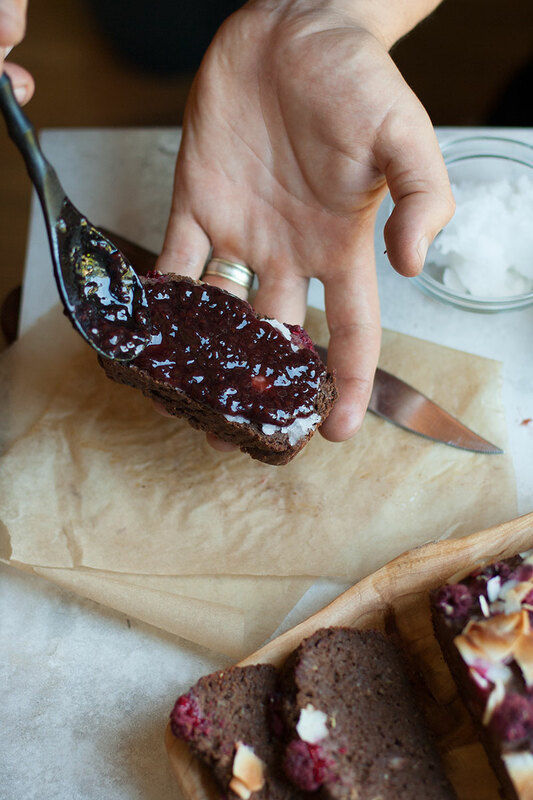 Serve with a little coconut oil or ghee and raspberry jam if desired. 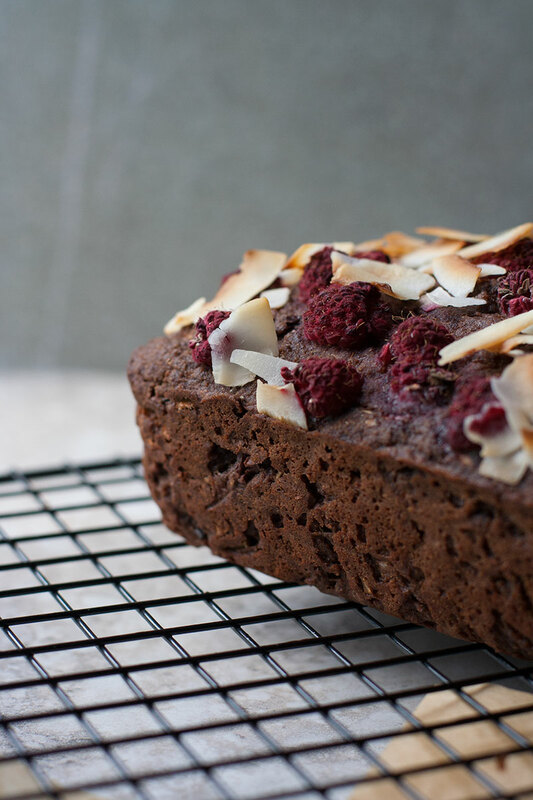 This bread is great on it's own, but simply decadent slathered with coconut oil or ghee and a little raspberry jam for good measure.